How cool is this? 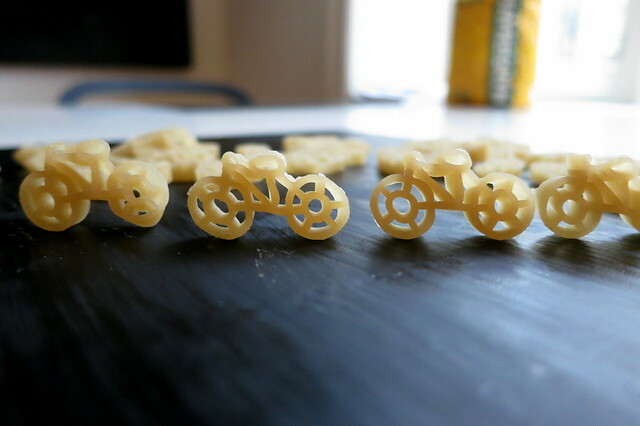 Pasta bicycles in a package of gluten-free pasta. You can make a whole Copenhagen rush hour with them! I can't remember the brand - I just put them in a glass jar - but I bought them the cool organic supermarket, Bio-Terre Épicerie Sante on St. Viateur in Montreal. Neat! I never saw them there before—I'll have to pop by there again and pick some up next time I'm in the neighbourhood.